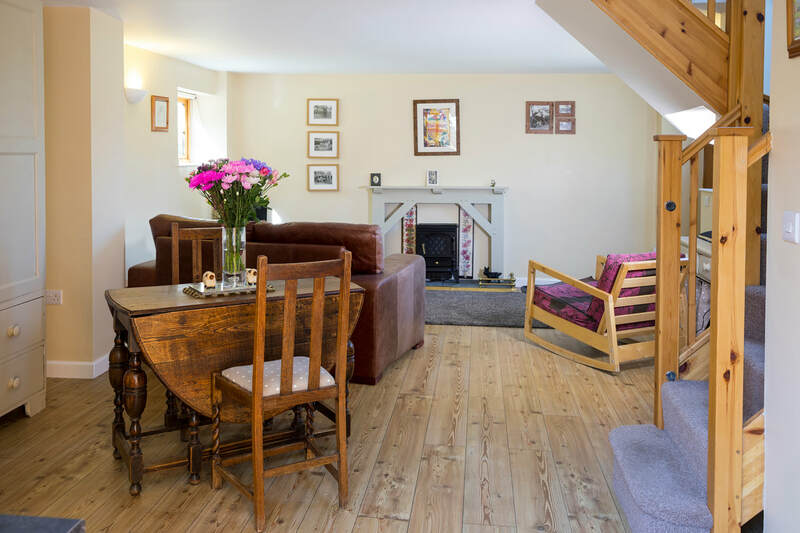 Woodpecker Cottage is a spacious yet cozy luxury one bedroom holiday cottage in our converted 19th century barn, ideal for couples seeking an idyllic country hideaway. 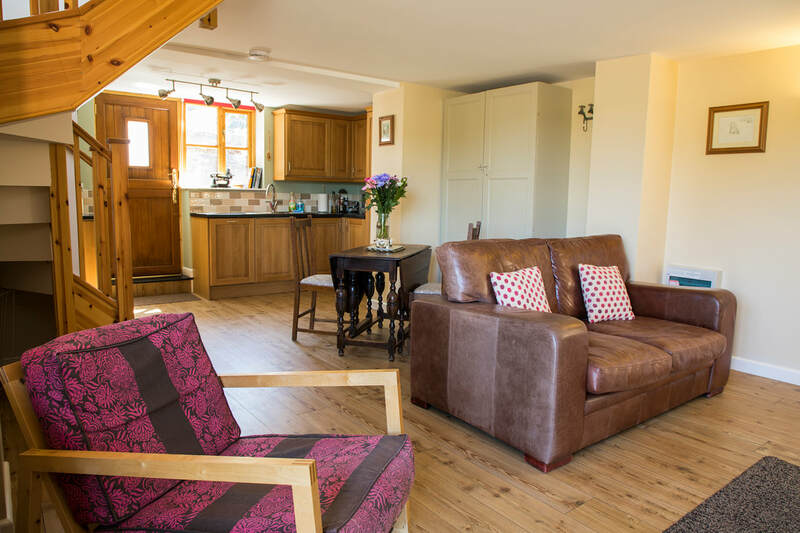 Downstairs the cottage has a large open plan living/dining area with comfy sofa and chair, oak fireplace, underfloor heating, TV, DVD, WiFi and dining table and chairs. This leads through to the well equipped oak kitchen area with oven, hob, dishwasher, microwave, fridge freezer and washing machine. 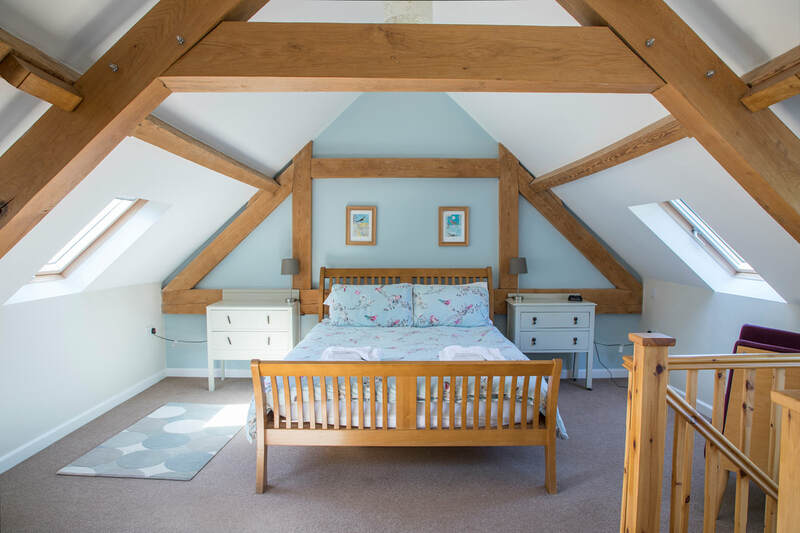 Upstairs the large comfortable bedroom has exposed oak beams, king sized oak bed and stunning views of Castell Dinas Bran, the Dee Valley and the surrounding mountains where you will enjoy the sunrise and sunsets over the valley. Off the bedroom is the bathroom with feature double end roll top bath and over bath shower. Outside there is an attractive enclosed paved courtyard with garden furniture and steps leading up to the private parking area for the cottage. The bedroom can also take a small cot or foldaway bed, making the cottage suitable for families with a small infant. Towels and bed linen are provided at no extra charge. We also provide a complimentary welcome pack for all our guests containing your immediate essentials and some locally sourced luxuries for a little bit of indulgence. Woodpecker Cottage is suitable for one well behaved dog. Bowls and doggy towels are provided at no extra charge, just request at the time of booking. Click here for more details. As the barn is situated in a rural area surrounded by working farms, we politely ask that guests keep to lanes and public footpaths and that dogs are kept on a lead when exploring the local area. The cottage is equipped with plenty of local maps, guides and suggested routes to help you enjoy this stunning corner of Wales. Click here to see more photos of the cottages and the beautiful local area.